Solicitors from Chester-based legal practice Aaron & Partners LLP joined up with experts from the University of Chester to inspire a group of budding Chinese entrepreneurs. Partner Mark Briegal worked with Dr Wing Lam, Deputy Director and Senior Lecturer in Entrepreneurship and Chinese Business Development at the university’s Business Research Institute (BRI), to guide a group of visiting research students, professors and entrepreneurs through topics such as UK business structures and intellectual property. The students are from South China Normal University, South Central University of Nationality, Huzhou Univeristy, Guangxi Normal University and Henan University of Economics and Law – some of the most prestigious universities in China. “We’ve got a strong relationship with the University of Chester and have worked together on a number of projects so we were delighted to have the chance to come and present to a group of enthusiastic and ambitious Chinese students,” Mark said. Mark was helped in his presentation by Debbie Dugdale, a trainee solicitor at Aaron & Partners and former senior manager at Lloyds Bank. 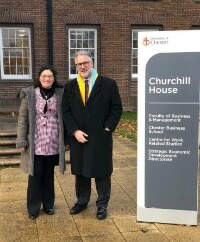 Dr Lam added: “The feedback that we had from the students and visiting professors was fantastic and we are hopefully they will have taken away lots of useful information about how UK businesses operate.